Featured recipe: Snapper pie, our signature dish! 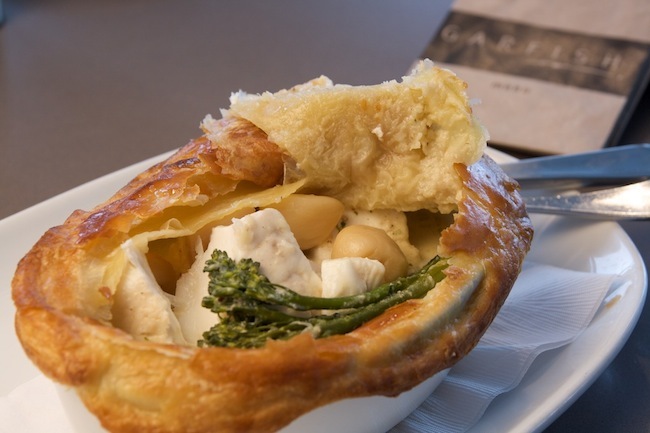 Garfish’s Snapper Pie has been on the menu in all our restaurants for over eight years. It remains the most popular of all dishes, the one that people keep coming back for. Its success relies on a subtle marriage of flavors to heighten the hero of the dish, delicately steamed pink snapper. The buttery puff pastry also contributes, making the dish extremely irresistible! This wonderful dish is featured across all of our menus. In fact regulars won’t let us take it off! Sweat onions in oil till soft (do not colour), then season with salt and pepper. Add stock and reduce sauce by half, then add the cream and reduce until slightly thickened. Pour mixture through a sieve, reserving liquid. Puree the onions in a food processor until smooth, then add the reserved liquid and combine to make a smooth sauce. Place back in the saucepan and bring to the boil. Remove from the heat, season to taste, then add chervil. Trim brocollini to 7cm lengths and blanch in plenty of boiling salted water until just cooked. Remove from boiling water and refresh in ice cold water to arrest the cooking, the broccolini should still have a bite to it. Cover the garlic cloves (skin on) in olive oil in a heavy saucepan, bring up to 70°c and cook slowly until tender. Remove from heat and let cool, then gently peel the garlic cloves. Have your fish monger fillet, skin and pin bone a whole snapper; tell him/her you need about 150g – 180g of fish per individual pie, he should help you select an appropriately sized whole snapper. Alternatively, purchase about 1kg to 1.2kg of filleted snapper and ask him to remove the skin and bones. You may need to remove the blood line (the very dark flesh that runs down the centre of the fillet just under the skin). Portion the snapper into 50g-60g pieces. Season with salt and pepper and then steam snapper in a steamer until the fish is cooked about half way through. Pour 100ml of soubise into the bottom of each pie dish. Add brocollini end to end. Place 3 pieces of snapper into each dish and top with garlic, then season. Paint the rim of the pie dish with a little egg wash to secure the lid whilst cooking. Place the puff pastry lid on top of the dish and brush with egg wash, ensure that the egg wash does not ‘pool’ on the lid. Cut a small slit into the lid to allow steam to escape during cooking. Place pies in a hot oven (180°c) for 8 minutes or until the puff pastry has turned golden brown, then reduce the heat to 150°c and cook for a further 12-15 minutes. Test the pies are hot and have completed cooking by inserting a metal skewer or small knive into the middle of the pie; the skewer should be very hot (steaming). Brush the top of the pie with melted butter and serve. At the restaurant we recommend serving a side of mash potato with the pie, and would also suggest a semillon or sauvignon to partner the pie. We’ve put together a short video featuring our executive chef, Stewart Wallace, demonstrating how to cook our signature snapper pie. Check it out below.